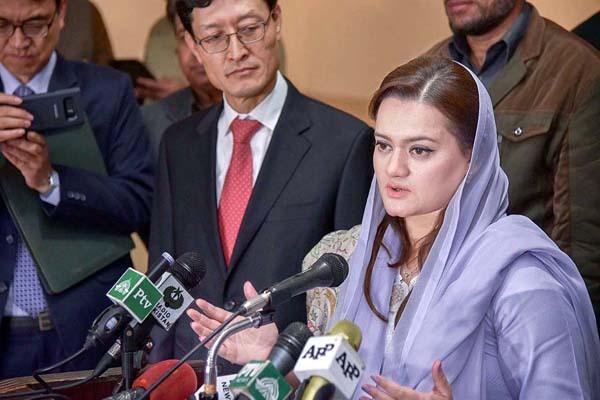 ISLAMABAD, Dec 18 (APP):Minister of State for Information, Broadcasting, National History and Literary Heritage Ms Marriyum talking to the media here Monday after the inauguration of the photo exhibition “Colours of Korea” at the Rawalpindi Arts Council posed a question as to why the yardstick applied in Iqama case was not employed on Niazi Services Limited? She said that when double standards were applied in law it tended to invoke critical voices and that was why the people, lawyers, constitutional experts and analysts criticized the decision to exonerate Imran Khan. The decision in Imran’s case had negated the barometer adopted in the Panama case, she added. The minister said that Muhammad Nawaz Sharif neither owned any off-shore company nor was a director, shareholder and beneficial owner of any company. She said that on the one hand Nawaz Sharif was disqualified on the basis of “Iqama” and on the other Imran was exonerated in spite of having admitted that he established Niazi Services Limited and purchased the London flat. Marriyum reiterated that the 28th July decision had triggered instability in the country.She said that raising a voice in self -defence did not tantamount to confrontation with the state institutions. She said that the PML-N had fulfilled all its promises with the masses and where ever one went in the provinces the work done by the PML-N government was quite visible. She said that the development projects from Gilgit to Karachi were a ranting testimony to the progress orchestrated by the PML-N government. She said that even in Punjab since 2013 or before that Shahbaz Sharif as Chief Minister had stood up to all the pledges that he made whether related to public transport or projects of public welfare. The minister said that Muhammad Nawaz Sharif had taken upon himself the responsibility to restore the sanctity of vote and it looked a real possibility in the near future. She said that the PML-N was the largest political party of the country and people voted for it in the name of Nawaz Sharif. She said that their leader Muhammad Nawaz Sharif had taught them the politics of performance and the party would win franchise of the people on the basis of its performance in the 2018 elections. Responding to a question, she said that whatever statements were given were a sequel to the voices raised by the people and the civil society. The consequences of the 28th July decision were visible to the entire nation and if the elected government was given the epithet of Sicilian Mafia then the reaction on it was a natural outcome, she added. She said that looking at the things in the context of history it transpired that whenever pressure was exerted on the institutions the law of necessity was also invented. The minister emphatically said that when Nawaz Sharif assumed power the country had steeped in darkness and today the country was producing surplus power and a mega-economic project like CPEC had been initiated. She asserted that as a result of the measures taken in conformity with the vision of the former prime minister and the sacrifices rendered by the armed forces and the law enforcing agencies peace had been restored in the country. She said that now they were talking about promotion of culture, heritage and revival of film industry, which was only possible during the PML-N government. She said that the development done by Muhammad Nawaz Sharif was visible all over the country adding that Prime Minister Khaqan Abbassi was making relentless efforts for the speedy completion of all the development ventures. The minister observed that it was inconsequential whether Zardari went to Qadri or Imran stood with Qadri, the people knew well which party was serving them. She claimed that Zardari and Imran had done nothing for their respective provinces and those who failed to perform could only indulge in conspiracies. The nation was witnessing since 2013 who was doing the real work and who was wasting their time. She said that Imran had failed to erect even a single railing for the Metro Bus which he used to criticize at the pitch of his voice. She said that the Insaf Bus was also lying in some deserted street of the province with deflated tyres and about 1,000 schools in Khyber Pakhtunkhwa had been closed. She said that Imran Khan only knew best to denigrate the state institutions and hurling abuses on whoever questioned him about his indiscretions. Earlier the minister along with the Korean Charge d’ Affairs and delegation inaugurated the Korean Photo exhibition and speaking on the occasion said that through the exhibition Korean culture had been introduced to the people of Pakistan. Congratulating the organizers of the exhibition she observed that even she had for the first time seen the biggest fish market established in Korea through this exhibition. She said that Korean culture programmes had also been held during 2017 in the country. She said that the pictures displayed in the exhibition showcased the Korean culture. The minister observed that the students of schools and colleges must also be made to visit the exhibition.